It’s another of our challenges, not often discussed. This image sets the challenge out nicely. Right place: Shellman Bluff, Georgia. Right time: Summer 2016. Right butterfly: Red Admiral (Vanessa atalanta). The Challenge, then? When I began photographing butterflies, and I remember this with a smile at the corners my mouth, I chased and shot almost all that flew. Know what though? I soon figured out that . . . most of y’all don’t, really, want to see worn butterflies. No more heavy wing scale loss, no more bird-struck wings, no more faded color. I disciplined myself, to only pursue and expose fresh, shmeksy! butterflies. Good strategy that, and wingedbeauty’s traffic climbed. The challenge? again. it’s shown here. Jeff spotted a Red admiral in an off-road spot, and sought after it. When it stopped it stopped on a downed tree trunk. The red admiral, once seen up close was worn, but featured great antennae, fine body and sweet blue dots at the trailing end of the hindwings. It was perky and alert. The log it was on introduced positive geometric to the view, with butterfly and log and an inviting angle. The log’s color was many variations of tan to brown, much of it rich browns, and the botany just beyond the log would not be focused in this Macro- look, but brought good eye-tantalizing rich green to the fore. So the challenge is: Butterfly worn but comely, and all around it, promising, very promising. I shot away, satisfied. Yes film is expen$ive, but I sought the look, the appeal. Photographing butterflies in the wild rewards us in so many unanticipated ways. The very same trail that led us to the Hermon Iris hit us again with this lovely, Gladiolus italicus. Both rare species of wildflowers grow where few ever venture, bloom just after Israel’s winter season has ended, and they exist very, very close to the border between Israel and Lebanon. The media report this northernmost Golan region as tense. The Hermon iris and this Common gladiolus evidence little interest or concern in the follies of mankind. 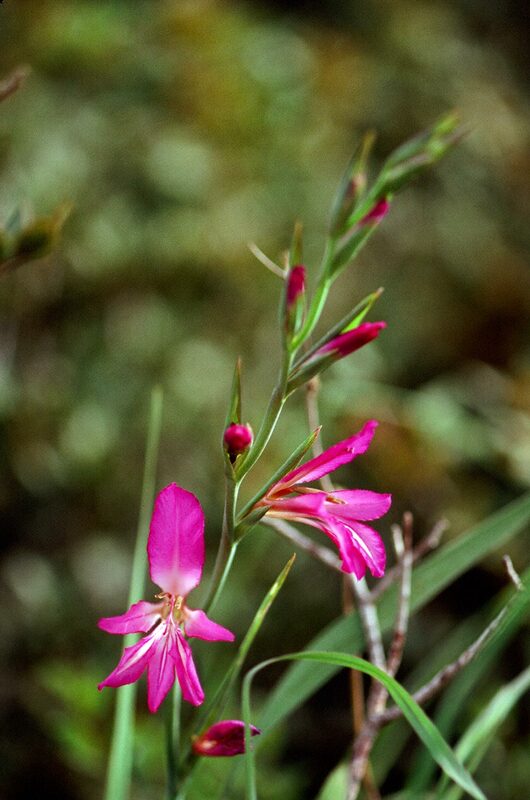 How vividly rich was the pink color of this wildflower. How were they bred to achieve the garden gladiolus that we grow in our gardens and put into our flower arrangements? How many funeral flower arrangements have their progeny beautified? Not always alone on this trail, a future post on wingedbeauty will be of the behemoth cows that briefly blocked our return walk on the trail. Amazing. These 1500 lb. or so cows left the iris and gladioli alone. Because they were protected or because their mothers somehow taught them to avoid eating these beautiful wildflowers. We saw no insects visiting the gladiolus, but in fairness we paused there for only a short time. Photographing winged beauties ends up not always being what you expected!